In a departure from what has historically been a rubber stamp vote, the majority of Democrats voted against Pompeo. Only half a dozen Democrats voted to confirm Pompeo, primarily from red states that overwhelmingly went for Trump in 2018 and who are facing tough reelection fights. Those Democrats included: Sens. Joe Donnelly (IN), Heidi Heitkamp (ND), Doug Jones (AL), Joe Manchin (WV), and Claire McCaskill (MO), and Bill Nelson (FL). Sen. Angus King (I-ME), who caucuses with Democrats, also voted in favor of Pompeo. A number of senior Democratic leaders had come out against Pompeo, threatening his confirmation early on. With Sen. Rand Paul (R-KY) initially in opposition and Sen. John McCain (R-AZ) recovering from brain cancer treatment, Republicans needed at least one Democratic vote. However, Paul reversed his opposition, after having several conversations with President Trump and Pompeo, saying his concerns over the wars in Iraq and Afghanistan were assuaged. After the vote, Sen. John Cornyn (R-TX), the Senate majority whip, blasted Democrats who voted against Pompeo and for delaying the confirmation of a number of Trump appointees. “The man has what it takes for the job. That’s why the no votes from our Democratic colleagues rang hollow,” he said. 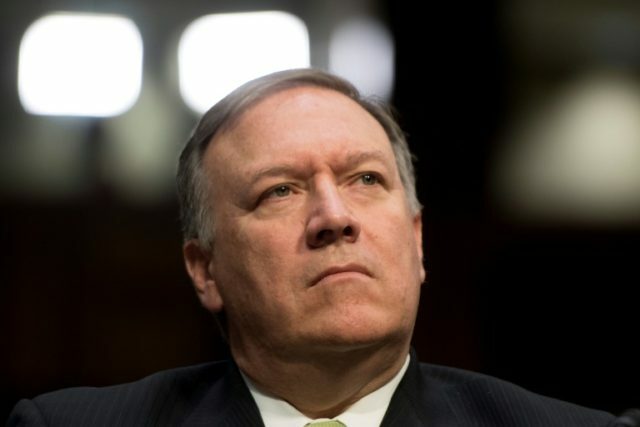 “It’s a sorry continuation of the hyper-partisanship they’ve been engaging in,” he added, noting that one year ago, 14 Democrats and one Independent had voted to confirm Pompeo as CIA director. Sen. Cory Booker (D-NJ) has said he opposed Pompeo’s nomination based on his gay marriage views, despite his 2008 endorsement of then-Sen. Barack Obama, who had the same views. Corker also opposed confirming Richard Grenell, who will be the Trump administration’s highest openly gay official as U.S. ambassador to Germany.